Wide receiver Chris Harper, waived by the 49ers on Thursday, was claimed Friday by the Green Bay Packers, the NFL announced on its daily transaction wire. The 49ers cut Harper to create a spot on the 53-man roster, presumably to add a defensive lineman for Sunday’s game against the Tennessee Titans. With nose tackle Glenn Dorsey listed as questionable, the 49ers are likely considering adding Mike Purcell off the practice squad or activating Quinton Dial from the reserve/non-football injury list. “We know what we’re going to do, but we’ll let the transaction speak for what we’re going to do,” 49ers coach Jim Harbaugh said. 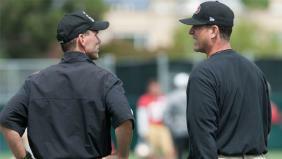 The 49ers plan to make the roster move on Saturday. The 49ers signed Harper off the Seattle Seahawks practice squad on Sept. 2. Harper was a fourth-round draft pick of the Seahawks. Also, 49ers coach Jim Harbaugh said wide receiver Mario Manningham is looking good after stepping back onto the practice field for the first time this week since sustaining season-ending torn ligaments in his left knee late last season. "He’s practicing now and (we) don’t have a crystal ball on exactly when he plays in a game, but it looks really good," Harbaugh said. "He had a very good day yesterday. I’m very excited for him. "(Manningham) looks good -- looks real good. It’s a matter of . . . it’s going to be soon." Outside linebacker Ahmad Brooks, who missed the past two days of practice due to a family/personal matter, will meet up with the team in Nashville over the weekend, Harbaugh said. Brooks is expected to play in Sunday's game.